A hive of activity – that’s what it feels like with all the professional scuba diving interns buzzing about our PADI 5 Star IDC Dive Centre here on Gaya island in Sabah, Malaysia. A few of the interns arrived in Malaysia pre PADI Divemaster; recreational divers who have not yet crossed into the realm of professional divers. Not, mind you, that it bothers our resident PADI Course Director, Richard, and his Go Pro team, because that’s what they live for – brining divers into the world of professionals, PADI Divemasters and beyond. The team cherishes every scuba diving student, with each achievement a win not just for the participant, but for the whole dive centre, soliciting celebrations worthy of the milestones. One such celebrant was Nena from Belgium, who is currently on our PADI Instructor Development Course, but when she first joined us was an interns on our PADI Divemaster Course. 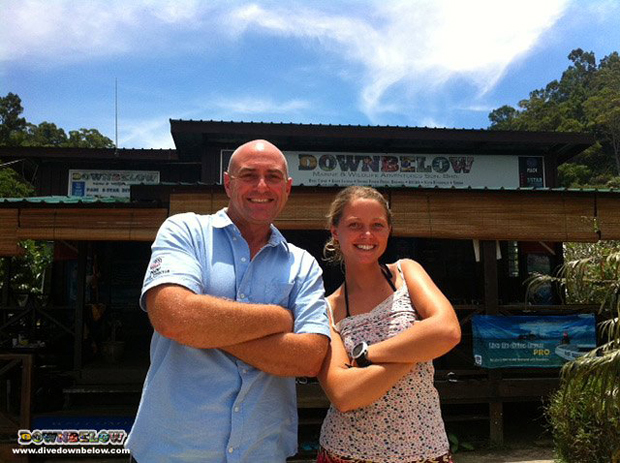 When she came to Sabah, Malaysia she had to first gain her PADI Divemaster qualification, which she did with flying colours. Every day a triumph, every day a celebration – and that’s how we roll here at the Downbelow dive centre in Sabah, Malaysia.